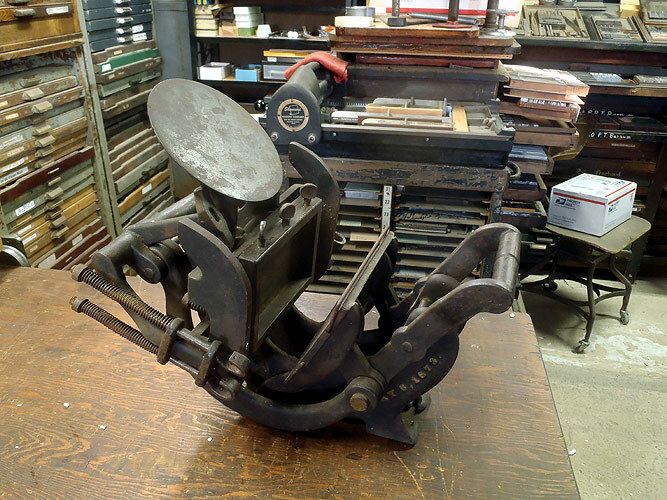 This is the press that got William Kelsey really started in the small press field. HOME ~ When was my press made? 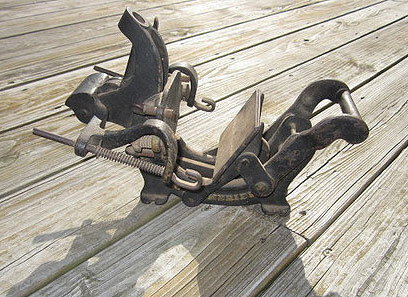 William Kelsey had had a few failures before producing this press and making The Kelsey Company a success. But make it a success, he did. By 1873, the Excelsior design had progressed to this stage. There were more improvements to make, and at least two major design changes before they ceased production in 1994. But this is the press that really got them started. 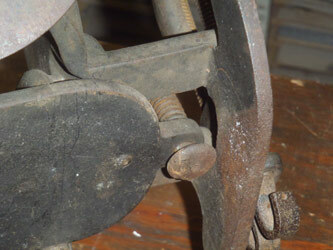 The Ink Disk on this old press looks quite a bit different than on later models and shows ratchet steps on the extreme outside of the disk, apparently to give more leverage to rotate the disk as it is pressed by the striker. The disk is 33 picas, 6 points or about 5 1/2 inches in diameter and has a 1/2 x 7/8" stem in the center. 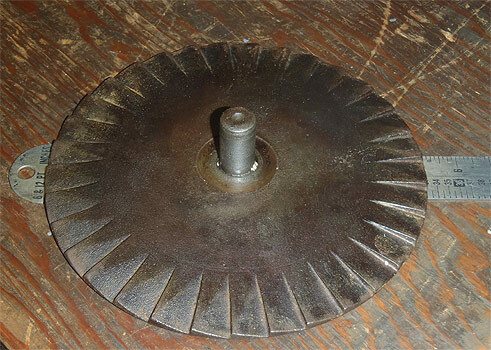 T he Chase is not an open frame, as on most platen press, but is permanently mounted to a flat base, which, when kept perfectly clean can serve as a good base to lock up type. As with all Kelsey chases, quoins are not needed to lock up a form. Sufficient pressure to hold type forms in place can be applied using a set of thumb screws on the top and the left sides of the mounted chase. 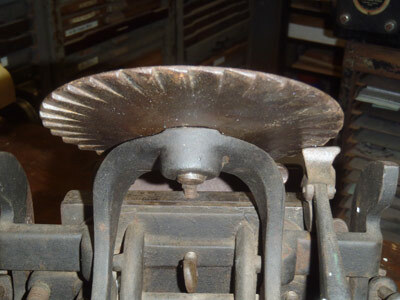 Locking up from the top and left suggests that the press would be used with gauge pins set to the right and bottom - opposite the more common trade-school technique of setting gauge pins on the bottom and left sides of the platen, with quoins set on the top and right sides of the chase. The chase mounts in a unique way as well. It is held in place by two spring-loaded moveable bolts on either side and rests on a ledge at the bottom. This requires a small tab be built onto the sides of the chase bed as shown in the photo above. The chase itself is permanently mounted to a 1/4" bed. 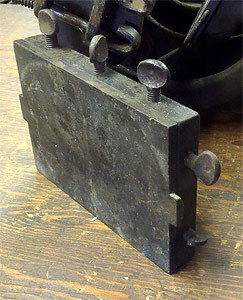 Note the side protrusion - this is to allow the spring-loaded bolts to hold it in place. This particular press was discovered near Salem, NY during the spring of 2011. 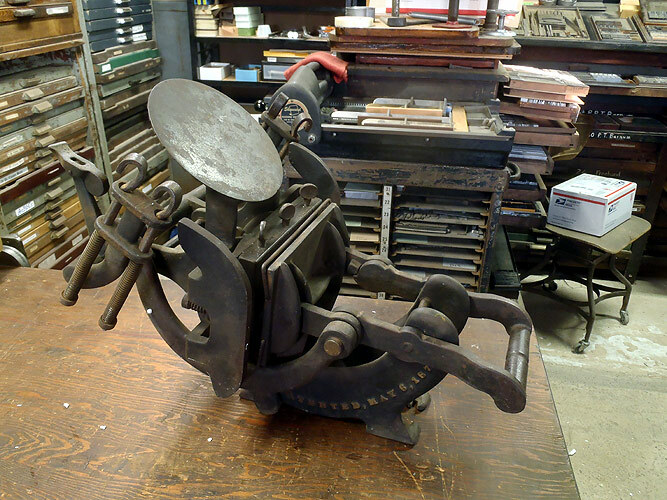 Kevin G. googled "Excelsior Press", contacted us and by May15, 2011, we had acquired this press for our collection. It's been a busy year, so we've only recently unpacked this press and have not cast rollers nor made trucks for it. Once we do, we will continue this description of the original Kelsey Excelsior Press. - Alan Runfeldt, Dec 7. 2012. 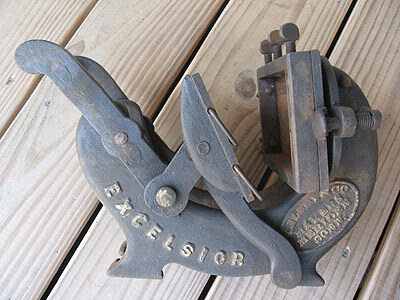 When Carl bought this press, he was expecting a 3x5 Excelsior. Since we have one here already, he & I both expected that we could duplicate our ink disk and chase & bed to fit his press. But, when we saw this photo - and the single roller hook, we realized that it is not a 3x5 Excelsior, But is instead the JUNIOR - a smaller model. Fabricating a replacement ink disk and chase-bed assembly will be a bit more challenging, but with our 3x5 to refer to, we expect we can do it. 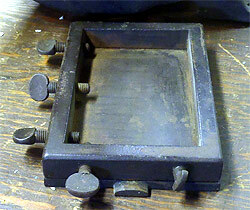 Carl's other press is indeed a 3x5 Excelsior, but as you can see, it has neither rollers nor an ink disk. This press is complete as it is. It was designed to be inked using a hand brayer. The ink disk and roller assembly were either an added feature, or came on later models only. We have just filled an order for gauge pins from Brock W., who describes his press as a 5x8 "Excelsior 1893" We hope to have photos of his press to add to this page soon. Our Friend Paul Aken at the Platen Press Museum in Zion, Illinois has some of these old presses as well. We also hope to soon have photos of his press(s) to round out this page on the earliest Kelsey Excelsiors. Note: In the early years, Kelsey Company dabbled in a quite wide variety of presses - including a flatbed cylinder newspaper press and the large "King" and "Star" Job Presses. A complete accounting of all of the presses they made is beyond the scope of this page - but may be covered elsewhere at another time. 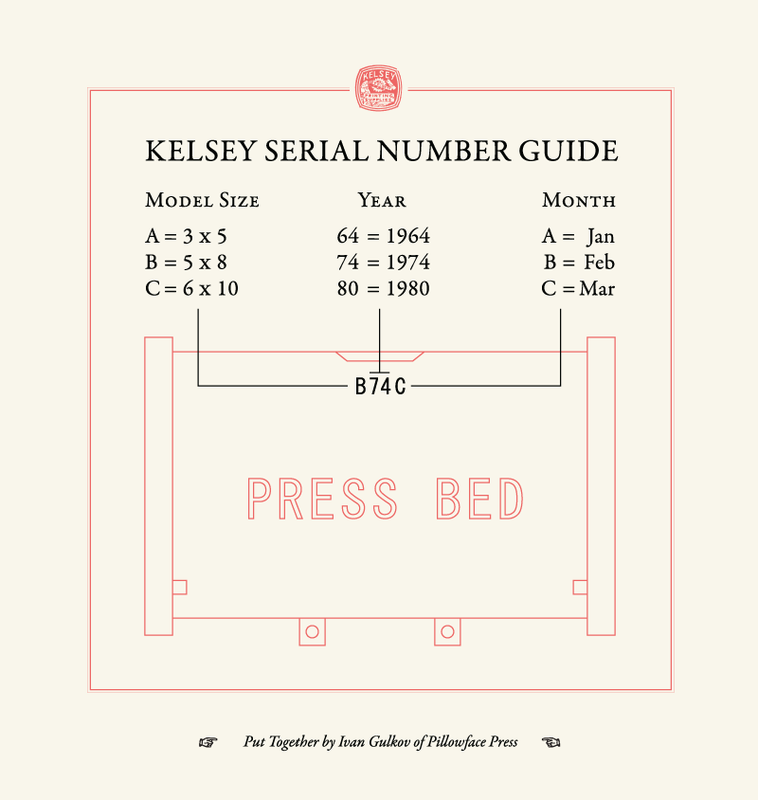 Although few, if any Kelsey presses ever had true serial numbers, sometime around 1960, Kelsey began stamping the chase beds with a date code. Click on image for closer look. 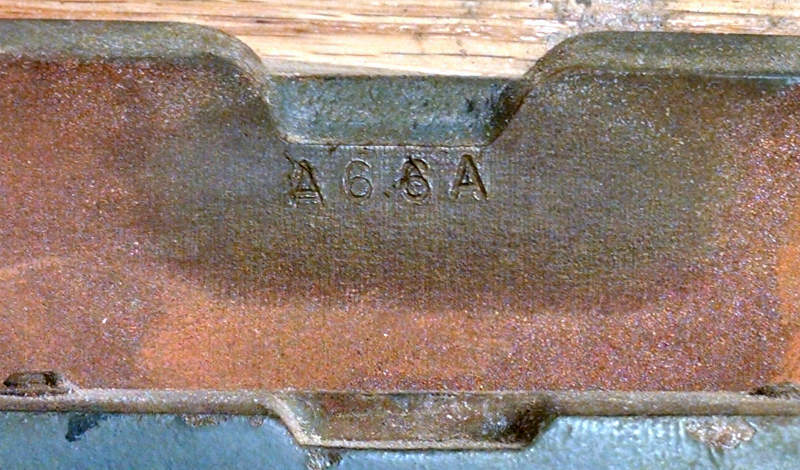 note also that while this bed was being stamped, the second "6" was mis-tamped with the "A" die, then over-stamped with the "6" in a second pass.. .